"Trinidad is the party island and people will lime and drink for any reason, even losing at cricket or football." The sun has just set on the tropical paradise of Tobago and Sunday School is getting under way in the small seaside town of Buccoo. These weekly gatherings draw the faithful from far and wide. It seems as if the whole island is turning up, dressed in their Sunday best – but this ritual has nothing to do with religion. This is Sunday School, Tobago-style. And it’s one big party. A steel pan band is in full flow on the open-air stage and several couples are wining (dancing provocatively) to the hypnotic beat. Everyone else in the square is liming (hanging out) under the stars, beer in hand, and listening to the music. The steel pan originates from twin-island nation Trinidad and Tobago, and you hear the distinctive sound everywhere. The pan music over, a DJ takes to the stage and pumps up the volume several notches with some down and dirty Soca grooves. Meanwhile, in a hall just around the corner, another DJ is laying down dance tracks and couples are ballroom dancing under rotating glitter balls. Outside the dance hall, an elderly Tobagonian is strutting his stuff in the road, oblivious to the cars crawling nose-to-tail past street food stalls that are doing a roaring trade. I’m done before midnight. But the party is only just warming up as many don’t arrive until then. Back at the Grafton Beach Hotel, 10 minutes up the coast, I head to the bar for a nightcap but Ali, the barman, has already closed up and is just heading off – to Sunday School. Next day he tells me that he didn’t leave until 5am, and it was still going strong. That’s as lively as Tobago gets. The rest of the week it’s a laid-back haven of tranquillity with stunning beaches lapped by the gin-clear Caribbean on one side and the Atlantic on its east coast, both teeming with coral and tropical fish, and rainforest-clad mountains that are home to most of Tobago’s 200-plus species of birds. Earlier that day I join a glass-bottomed boat trip out from Store Bay to Nylon Pool, a shallow pool in a coral sandbank surrounded by azure sea. It’s a popular spot to visit by boat, the well prepared bringing bottles of rum and cola to sit in the shallows drinking and liming. 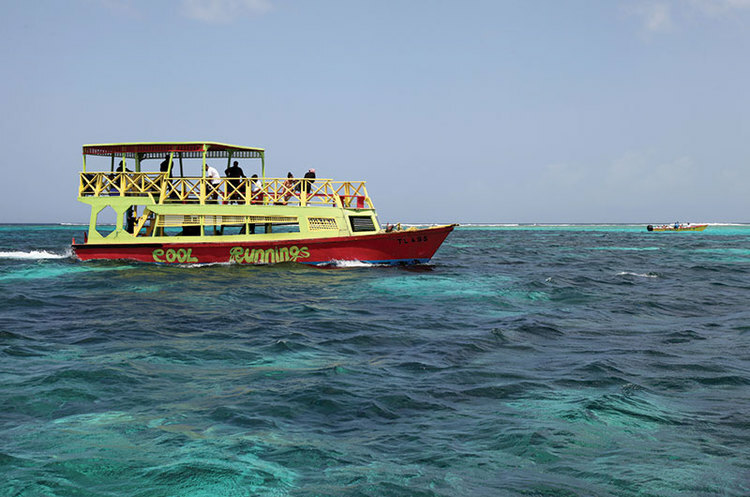 We drift over Buccoo Reef, gazing at the dazzling colours of the corals and fish through the glass hull windows while some jump in and snorkel. Store Bay has showers and changing rooms, so I freshen up before an al fresco lunch of Tobago favourite crab and dumplings and a mooch round the souvenir stalls. My first five nights in Tobago are split between the Grafton Beach, a family resort perched above a sweeping bay of golden sands, and its quieter, adult-only sister property, Le Grand Courlan, next door. I am playing golf at nearby Mount Irvine Bay Golf Club and want to explore the island, so I rent a car from family-owned KCNN’s Rentals. I end up totally lost several times as I have only a basic tourist map and the roads are devoid of signs. But I discover some delightful hidden coves and villages and am pointed in the right direction whenever I stop to ask where I am. Tobago is a small island at just 27 miles long and 7.5 miles wide, so you can never stray too far and everyone is friendly and helpful. Although both Tobago and Trinidad are bird-watching hotspots, you don’t have to be a twitcher to enjoy their incredible bird life. I take a guided bird-watching tour into Main Ridge Forest Preserve, established in 1776 and the oldest legally protected forest in the western hemisphere, with Tobago’s bird whisperer, Newton George. On a two-hour hike through trees echoing to a cacophony of tropical birdsong, he mimics bird calls so they answer back and points out numerous colourful species including the blue-backed manakin, the most sought-after species because it is found only on Tobago. Food is one of the delights of Tobago and Trinidad, and lunch following the forest tour is by the beach in Speyside at Gemma’s Tree House, a family-run restaurant built on stilts around a huge tree. The food is simple and typical of a traditional Sunday lunch cooked in every Tobago home, comprising ground provision – various root vegetables – with rice, meat and fish. It is the best meal of the trip and I walk it off on a short hike to pretty Argyle Waterfall. I fly to neighbouring Trinidad for a couple of days, staying at the charming Coblentz Inn boutique hotel in the nation’s capital, Port of Spain. It is a peaceful sanctuary in a city that is both highly industrialised and frenetic, with traffic so bad on weekdays that getting to or from the airport can take several hours while city centre roads are constantly jammed. Go at the weekend, however, and you can enjoy it without the crowded roads. My tour guide, Nick, aka Gerald Nicholas, the owner of Sensational Tours, tells me Trinidad is the party island and people will lime and drink for any reason, even losing at cricket or football. Trinidad Carnival is known as the greatest street party in the world. But while the island is not regarded as a tourist destination as Tobago is and lacks beach resorts, it has some wonderful attractions of its own. 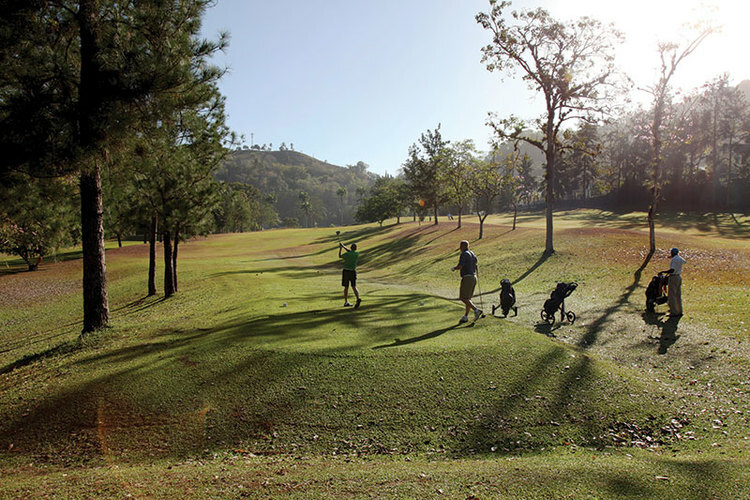 One is golf, and I play two courses – Millennium Lakes Golf & Country Club and St Andrews Golf Club, the former run by Trinidad cricket legend Brian Lara’s sister-in-law, the latter by an elder brother. According to Nick, you haven’t been to Trinidad unless you try three things: roti; doubles; and bake and shark. I tick off all three; roti (a type of flatbread) at Port of Spain institution Shiann’s Food Palace; doubles (patties filled with spicy channa, or chickpeas) at Queen’s Park Savannah; and bake and shark (a street food seafood sandwich) at Richard’s Bake and Shark on beautiful Maracas Beach on Trinidad’s north coast, famous for serving the best. 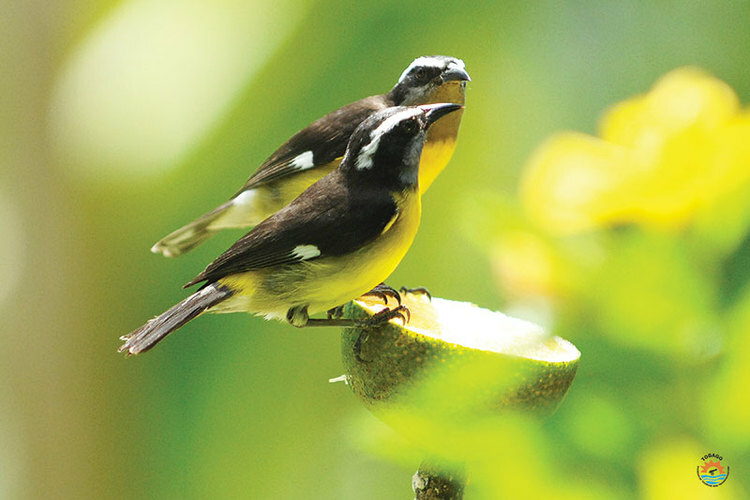 Trinidad’s other key attraction is its birdlife. It has its own national bird, the scarlet ibis. Caroni Bird Sanctuary, a mangrove swamp close to Port of Spain, covers 40 square miles. Its most famous resident is the scarlet ibis, Trinidad’s national bird. I join a dusk boat tour and am rewarded with the amazing sight of huge flocks of these colourful birds flying in to roost. There are about 18,000 of them in Trinidad and they return to their roosts in huge flocks from all directions, blanketing the mangrove trees with red. They get their vivid red colour from carotene in their diet. Elsewhere there’s Yerette, a secret garden, created in a residential neighbourhood above Trinidad’s Maracas Valley, which was created as a hummingbird haven and attracts the Caribbean’s largest concentration of them. And inland, the Asa Wright Nature Centre covers almost 1,500 acres of mainly forested valleys. A nocturnal oilbird breeding colony is one of its highlights. Back on Tobago, my final base is the luxury Magdalena Grand Beach & Golf Resort, on the Atlantic coast. While I’m there, the Trinidad and Tobago prime minister arrives with his entourage. Two days later I am introduced to him by my playing partner, a local golf pro, when we end up playing golf at adjacent holes on the hotel’s on-site Tobago Plantations Golf Club course. He asks if I am enjoying my stay and I tell him I feel thoroughly at home. After all, I have limed and dined just like a local. Book it: Funway offers seven nights at the Magdalena Grand Beach & Golf Resort, flying with British Airways, departing November 25, from £985pp, including two rounds of golf.